Feline love bite kitten style. The picture appears to be in the public domain. I think that “love bites” is a slightly misleading description of what is happening. There’s not a lot of love in a cat bite although it is frequently done with only a touch of aggression (play aggression) rather than as a genuine, hard bite. Nonetheless it may hurt and it may break the skin. There is only a passing similarity between the human love bite and the feline version because the motivation behind it is nearly always different1. A domestic cat bite is a ‘killing action’ even in play. Cats are born with this skill but why do cats do it to us and what does it mean? A cat love bite is play; in short, killing practice. You see kittens playing amongst themselves and they can be quite rough with each other. When it hurts, a kitten will scream to make it known that she objects to the level of aggression in the play. Kittens learn the limits of play biting in these sessions. This may come about because you are roughhousing with your cat. For a cat, hunting is fun. They are “prey players”. They don’t respond to roughhousing play as a dog might. They respond to rough play in kind which means biting and possibly scratching or it may go further than that from the cat’s standpoint. He may respond with fear and defensiveness and start to bite hard. Really, the key dealing with this is to understand how your cat is going to respond by reading your cat’s mental state or mood. You have to be able to read it through body language. It is as if a switch is thrown when your cat turns from being passive to apparently aggressive and administering a “love bite”. You need to understand when the switch is about to be thrown. You can see it in a cat’s demeanour and of course through learning your cat’s behaviour during previous interactions. Both cat owners and their cats need to learn and understand each other. Petting can lead to overstimulation. This is a result of petting in a certain way or petting for too long. I have discussed this on several occasions on the site (please use the custom search tool). You have to know the limits of petting. All cats don’t like it equally. Some are more sensitive towards it while others are more tolerant. When petting, it’s advisable to know when your cat is in a mind set which won’t result in a love bite. Your cat shouldn’t be hyped up. In the words of Jackson Galaxy, “Only approach your cat for petting when there is a sleepy late-night vibe, as opposed to when she is ramped up and ready to play”. Domestic kittens and cats need to learn that hands are not toys. Sometimes people can inadvertently train their cat to treat their hands as toys. You will have to try and encourage your cat to unlearn this behaviour. One thing you can do is to not dangle your hand in front of your cat like a cat tease (a feather on a stick), which is an invitation to attack. Maybe it’s better to approach your cat with your hand from a low position and approaching gently and slowly. And in a family it’s important that every member of the family interacts with the family cat in the same way in order for the cat to unlearn undesirable behaviour. Love bites may occur when you rub your cat’s belly. When she rolls over onto her back to expose her belly she is saying, “I trust you” – which is really nice. In the words of Galaxy it is the nearest you will get to “the cat hug”. However, this is not an invitation to put your hands on her belly. Your cat may accept her belly being petted because of years of doing it but she may respond with a love bite (nibble) or worse because she may see your hand as a threat. It’s a question of reading your cat and understanding her. I think the basic default position with respect to petting your cat’s belly is to do it with caution and gentleness while reading feline body language. You have to know when it can and can’t be done safely. It’s the old adage: ‘respect the cat’ through understanding. 1. Sometimes the human love bite is in play too. 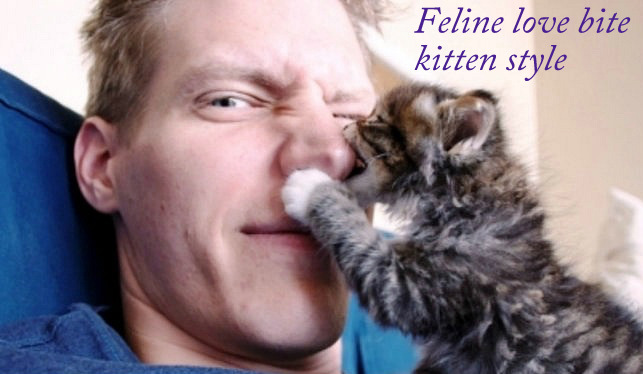 Home→Cat Behavior→play→Cat love bites – what do they mean and why do they happen? This entry was posted in play and tagged cat behavior, cat bite, Cat Body Language, cat play, human to cat relationship, interacting with your cat, love bite, provoked cat aggression by Michael Broad. Bookmark the permalink.